A gaming keyboard is a vital part of a gaming system especially if you play competitive games online. When you are in an intense match you need the keys to register on time and you do not want any keys to conflict with one another or ghosting to happen. These are just some of the reasons why players opt to get a better keyboard that is designed for gaming. $100 is a decent budget for a gaming keyboard and there are plenty of options on the market that offer all kinds of features and that can make it a bit overwhelming and confusing. The challenge here is to find the best value for money and the keyboard that suits your needs the best. Nowadays gaming keyboards come with all kinds of lighting effects and there are different designs and layouts that you can choose from. This is one of the reasons why a gaming keyboard not only need to do its job but should look good as well. Gamers usually match the design and color of the components of their build and the keyboard is no exception. If you are in the market for a new gaming keyboard, then you have come to the right place. Here we are going to tell you about the keyboards that we can recommend for under $100. You’ll find a more in-depth review of every gaming keyboard further down this article. This comparison table consists of our absolute top rated picks after having a look at most budget gaming keyboards available. Corsair is a well-known brand when it comes to gaming products and the K55 gaming keyboard is no exception. 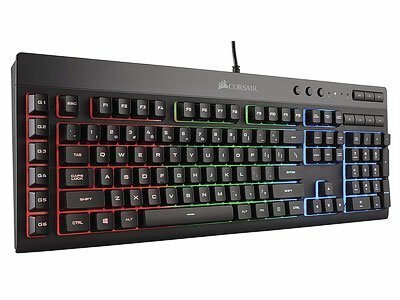 It is surprising that we have a Corsair branded keyboard in this price range and this is a great buy if you are on the market for a new gaming keyboard and are on a budget. The Corsair K55 is a very impressive keyboard for the price. While the keyboard does not have mechanical keys, the membrane keys that it has are very good. The keyboard is great to type on and is well made. Even though the keyboard is made of plastic, there is very little flex. RGB lighting is one of the major selling points of this keyboard. If you want to get a membrane keyboard that is well made and comes with RGB lighting then this is an option that you should consider. The K55 is a full keyboard and comes with RGB lighting. There are more than 10 lighting modes that you can choose from in order to customize your keyboard. While this is not a mechanical keyboard the keys are silent and work well. Other than that, you also get 6 programmable micro keys which you can map according to your needs. The keyboard also comes with volume and multimedia keys that help you control volume and other functions without leaving the game. The keyboard is made of plastic and is light but has little to no flex even when typing. Do not believe people who say that it feels like a mechanical keyboard because this is a membrane keyboard and there is a clear difference. What I can tell you is that there is a clear clicky feel when a key is pressed and while the feeling is hard to describe in words, it is unusual for a membrane keyboard. Overall the design is clean and the RGB lighting can add a personal touch to your setup. The keys are responsive and great to type on. Here is what you need to know about the Corsair K55 gaming keyboard. Logitech is a major player in the peripherals market and the company has made a name for itself over the years. Logitech makes all kinds of gaming peripherals and the products are known to have great build quality and functionality. The G610 Orion mechanical keyboard is no exception. The keyboard uses Cherry MX Brown switches which have a very tactile feel and do not produce a lot of noise which is something important to note when buying a gaming keyboard that is mechanical. These are great for both typing and gaming. This is a full-sized keyboard so not only do you get the arrow keys but the number pad as well. Logitech is a major player in the peripherals market and this is one of the products that it has to offer. This might seem to be a simple keyboard but it is more than capable of getting the job done. The mechanical keyboard is great for gaming and typing and uses Cherry MX Brown switches. If you are in the market for a new gaming keyboard then this is an option worth looking into. While the keyboard does not come with RGB lighting, the keys are backlit so you will be able to work and game properly in the dark. The keyboard also comes with dedicated media buttons so that you can control setting like the volume without having to leave the game. They keyboard works fine with previous versions of windows as well so compatibility should not be an issue for Windows users but if you use other operating systems then you should look into the compatibility options. 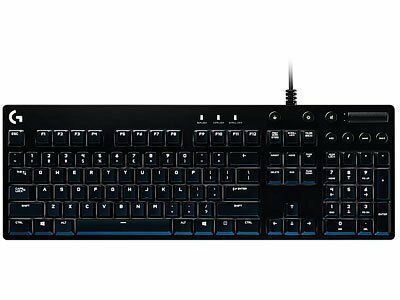 Here is what you need to know about the Logitech G610 Orion keyboard. This is a 10 keyless keyboard that does not come with the number pad but it does have the arrow keys. This is one of the reasons why the Alloy FPS Pro is so compact. The design is simple and minimal which I personally like in a gaming keyboard. Gaming peripherals try to be flashy and crazy by offering all kinds of designs but I for one like my peripherals to be simple and clean and I think that there are others just like me. The keyboard has a solid metal frame and it feels premium and durable. It has some weight so it is stable and won’t be moving around your desk. The keyboard uses authentic Cherry MX Red switches which are great for typing and gaming. It also comes with a braided cable that can be detached. This is another simple keyboard but it does come with Cherry MX Red switches which are great for gaming. The 10 keyless design is simple and clean and something that I prefer to use when gaming or working. If you need a compact keyboard that is great for gaming and typing then this is what you should go for. While the Allow FPS Pro does not come with RGB lighting, you have Red LEDs which can be turned off as well. Something to keep in mind is that the keyboard officially supports Windows and compatibility with TVs, gaming consoles or Mac is not officially listed. HyperX is a pretty well-known company in the gaming space and has made a name for itself over the years. It is known for products that provide great performance and this keyboard is no exception. All things considered, here is what you need to know about the HyperX Allow FPS Pro keyboard. 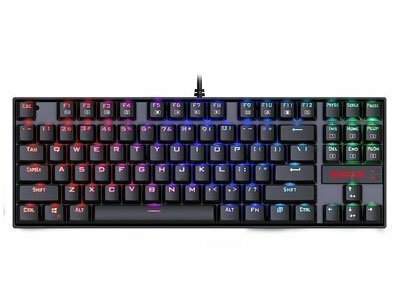 The Redragon K552 RGB is the next keyboard on our list. This is a company that has been introducing great products for budget gamers. The products that the company offers are competitively priced and that is why people are taking a lot of interested in these products. This is a 10 keyless keyboard which is not something that everyone likes but I for one prefer these over the standard keyboards. A 10 keyless motherboard does not have the number pad but does come with the arrow keys unlike other smaller keyboards that are available on the market. The Redragon K552 is a very interesting keyboard that not only looks great but is functional as well. The keyboard has mechanical switches which are not common in a keyboard under $50. If you want a mechanical keyboard but do not want to spend too much money then this is an option that is worth looking into. The keyboard has a metallic finish which gives it a premium and durable feel. Other than that, the keys are mechanical and use custom switches which the company claims to be similar to Cherry MX Blue switches. You also get RGB lighting and you can choose from a couple of effects as well. Not only can you change the different colors but you can also play with the brightness levels as well. For the price, this keyboard is great value for money and comes with all kinds of features. Overall the keyboard has a clean and functional design which not only looks good but feels great as well. I for one am very interested in this keyboard and would personally add it to my build. The keyboard is splash-proof so if you like to have a drink while gaming then dropping some on the keyboard will not be an issue. This is a nice feature to have as liquids can often get into keys and they often stop working. This keyboard has 87 standard keys and 12 multimedia keys as well. The USB connector is gold plated for extra durability. All things considered, here is what you need to know about the Redragon K552 RED gaming keyboard. Razer is known for making some great gaming products and this is no exception. The design is simple and clean and because this is a Razer product you know that it will endure the long gaming sessions that you put it through. The keyboard has a spill-resistant design and if you drop some liquid on it then it should be fine. That will also help when you have to clean the keyboard. The keyboard has individually back-lit keys and comes with RGB lighting so there are loads of customization options for you to play with. The keys are soft and silent. You don’t need to apply a lot of force to activate the keys. The Razer Cynosa Chroma keyboard is a great keyboard for the price. The simple design and RGB lighting make it great value for money. This is a Razer product which is made by gamers for gamers so you know that it is going to do its job just fine. If you are looking for a decent gaming keyboard from a well-known gaming brand then this is an option that is worth looking into. With this keyboard, you should not experience any kind of ghosting and you will be able to press 10 keys at a time. This is something that you need to keep in mind when gaming. There are times when you need to press multiple keys at the same time and ghosting can be a common issue in cheaper keyboards. The keyboard is very comfortable and you can adjust the height with the feet at the bottom. All things considered, this is a great entry-level keyboard and for the price, you are getting a very decent product from Razer that will be able to keep up with your gaming needs. If you are on a budget but want something from a well-known brand then this is an option that is worth looking into. Here is what you need to know about the Razer Cynosa Chroma keyboard. This is a full-sized keyboard that comes with the arrow keys and a number pad. There are plenty of dedicated media keys as well that you allow you to play with settings without having to leave the game. The Alloy Elite has a metal top plate which gives it a premium and sturdy feel. Other than that, the keyboard uses Cherry MX Red switches which are great for gaming and typing. The Alloy Elite does not come with RGB lighting but it does have Red lights which you can turn on if you need to type in the dark. Other than that, there is an LED bar running on the top of the keyboard which can be personalized using the different setting options that are available. There are 6 LED modes and 4 brightness levels that you can play with. The HyperX Alloy Elite is made for gamers and it offers great value for money for the price. It comes with Cherry MX Red switches which are great for gaming and typing. The keyboard not only functions well but looks great too. If you want to get a gaming keyboard under $100 then this is one of the best options on the market right now. The keyboard also comes with an integrated wrist rest. A wrist rest might be the last thing that comes to a gamers mind when setting up a gaming system. These do not seem as important as other gaming accessories. Wrist rests comfort your wrists and let you type or game for longer periods of time. You may not realize the importance of a wrists rest until you start feeling discomfort or start using one. In this case, the wrist rest is integrated into the keyboard and you are getting it for free. At times the keyboard does not have such an option and you need to get one separately. For the price, the Alloy Elite is a great mechanical keyboard that comes with an integrated wrist rest. You should get this keyboard is you can live without RGB lighting and need a decent mechanical keyboard. Here is what you need to know about the HyperX Alloy Elite gaming keyboard. Here we have another keyboard from Razer but this one has membrane keys with a mechanical feel to them. This is dubbed mecha-membrane keys. These keys are supposed to be the best of both worlds and are supposed to be soft like membrane keys but clicky like mechanical keys. The Ornata Chroma comes with mid-height keys which are neither too low nor too high. This is supposed to help when typing and prevents the user from missing a key. You do get the Razer RB Chroma lighting which you can customize to your liking. Razer is known for making some great gaming gear and this is a perfect example of that. While this might not be a mechanical keyboard it does come with RGB lighting and an integrated wrist rest. If you are a Razer fan then this is a great option to look into. The keyboard also comes with a magnetic wrist rest that snaps into place but can be removed as well. A wrist rest might be the last thing that comes to a gamers mind when setting up a gaming system. These do not seem as important as other gaming accessories. Wrist rests comfort your wrists and let you type or game for longer periods of time. You may not realize the importance of a wrists rest until you start feeling discomfort or start using one. In this case, the wrist rest is integrated into the keyboard and you are getting it for free. All things considered, here is what you need to know about the Razer Ornata Chroma gaming keyboard. The Gigabyte mechanical keyboard is a very simple one. It does not come with flashy RGB lighting but I know that there are people that are not into that sort of thing and want something simple and traditional that gets the job done. If that is what you are looking for then this is worth looking into. This is a very simple and basic keyboard for people that do not want anything flashy. If you do not like RGB or LED lights then this is a great keyboard to consider. This keyboard offers great value for money keeping in mind that you get Cherry MX Red switches. Your typing and gaming experience should be great. The keyboard is well made and features Cherry MX Red mechanical switches. The keyboard is great value for money keeping in mind that you get Cherry MX Red switches for the price. There are a few other options that offer the same features in this price range. The keyboard has a metallic finish which gives it a premium feel. There is no flex while gaming or typing. The keyboard is very simple and people will miss some keys like additional media keys for adjusting volume and other settings when in-game. There are some keyboard shortcuts that can help you but having dedicated media keys is always a plus. If you are looking for a keyboard that is basic and simple then this will work for you. The design is sturdy and will last a long time if you take proper care of it. I know that there is a market for this product and that is why people are buying it and giving it such great reviews. Even though it is 2019 and RGB has taken over the gaming space, there are still some people that like to keep things simple. Here is what you need to know about the Gigabyte mechanical keyboard. This is a company you might not have heard of before but this keyboard has received a lot of praise and great reviews because it not only functions well but looks great too. The keyboard has a very unique design and the RGB kind of leaks out of the sides. This is a very interesting effect and something that you might like if you are into RGB lighting. The ET Robot mechanical keyboard is pretty inexpensive as compared to other keyboards on the market that use the same switches. The design is very unique and will stand out from the usual products that you have available. If you need something that is different and works well too then you need not look any further. This is a great option for gamers and people that do a lot of typing. They keyboard is made from brushed aluminum and the keys use Cherry MX Blue switches which are great for gaming and typing. The design is very unique and unlike any other keyboard that you will find on this list or anywhere else on the market. There are 64 LED RGB lights around the keyboard that give that bleed out effect and there are 36 lighting modes to choose from so you will find something that you like. They keyboard does have some weight to it and it feels premium and durable to touch. It feels like it will last a long time provided that you take proper care of the product. Something to keep in mind is that the RGB strip is away from you, so you won’t be able to see it in proper lighting or when you are away from the keyboard. It would have been better if the lights were all around the keyboard. Here is what you need to know about the ET Robot mechanical gaming keyboard. This is not a company that most people will have heard of but the keyboard is great value for the price. The keyboard comes with RGB lighting and not only can you select different lighting modes, you can also select the intensity of the lights. This is an interesting feature and not something that you get in this price range. If RGB is not your thing then these effects can also be turned off. You can also set a single color such as Red, Green, Blue, Yellow, Purple, Cyan, Pink. You get 19 conflict-free keys and 8 multimedia keys as well. The keys have a very premium feel and the keyboard has a metallic finish which makes it feel like a $100 even though it is not. The keys do not make a lot of noise which is another interesting factor that you should keep in mind if you are in the market for a new gaming keyboard. The keyboard and mouse combo are great value for money if you are looking for a membrane keyboard and decent mouse that not only work well but match your build as well. The RGB effects are great and you can set the lighting according to your mood or preferences. This combo is great value for money and if you are on a budget then this is an impressive offer to consider that not only comes with a keyboard but a mouse as well. This is a combo so you also get a mouse with the keyboard. The mouse has an impressive design and comes with LED lights as well. There are two buttons on the side that can be mapped according to your preferences. There is a DPI button on top which can be used to adjust the DPI between 800,1200, 2400 and 3200. I personally like the Space button which is ideally shaped for gaming as well as typing and the mouse cable is braided and does not tangle easily. This ensures that the mouse will stand the test of time even when used daily. While this combo is inexpensive, it should last you a long time provided that you take proper care of the peripherals. All things considered, here is what you need to know about the HAVIT keyboard and mouse combo. These were all the major keyboards that we can recommend for under $100. These are some of the best options on the market right now and offer the best value for money when it comes to the features and build quality. If you are still not sure which one you should get then you can go with the Gigabyte mechanical keyboard is you do not like RGB lighting. On the other hand, if you do need RGB lighting then you should go for the HyperX Alloy Pro. If you are on a budget and need something entry-level and do not want to spend money on a mechanical keyboard then the Corsair K55 will do the job just fine. There are plenty of keyboards on the market and they all have their own unique designs and features. If you are new at this then you can easily be confused. Here we are going to look into the different aspects of a gaming keyboard and what you should look for when buying one. By the end of this guide, you should have a clear understanding of what different terms mean and what kind of specifications you should be looking for in a gaming keyboard. There are generally two kinds of keyboards a membrane keyboard and a mechanical one. Each has its own pros and cons and you should consider both before deciding which one you should get. Here we are going to look into both types and walk you through what you need to know about them. In a membrane keyboard, the keys have different membrane layers which are used to send a signal to the PC that a key has been pressed. There are certain pros and cons of getting a membrane keyboard. Membrane keyboards are great to type on and while Mechanical keyboards are said to be better, the advancement of technology has left a small gap between them. If you have a decent membrane keyboard then it will be hard to tell the difference. This depends on the keyboards that you are comparing. There is no doubt that a $50 membrane keyboard will not be able to compete with a $200 mechanical keyboard but if both keyboards are in the same price range and are carefully selected then they can perform and feel similar. Another advantage of using a membrane keyboard is that they are rather silent when compared to a mechanical keyboard. Mechanical keyboards have a rather loud clicky sound when a key is pressed and while that is something that some gamers like, it can be rather distracting for other people that might live with you. 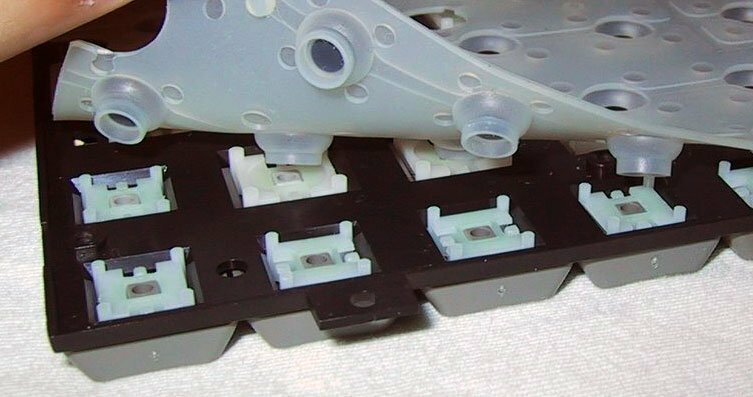 There are different kinds of mechanical switches and some are louder than others but membrane keyboards are generally quieter. While there are exceptions, membrane keyboards are usually made of plastic which means that they are light and if you are on the move you can easily take one with you. A general trend is that these keyboards are also less expensive when compared to mechanical keyboards which is one of the reasons why they are commonly used by gamers. Moving on to all the things that are negative about membrane keyboards, some people find the keys mushy and that it affects the typing experience. Membrane keyboards often require more force to press a button which is something to keep in mind if you spend most of your time on a PC, working or gaming. It will affect you in both cases. I myself spend most of my time in front of a PC. When I am not gaming, I am typing and I often feel that a mechanical keyboard provides a much decent typing experience as compared to a membrane keyboard. I have messed with a couple of keyboards and in my experience, even cheaper mechanical keyboards from reputable companies are better than most mid-range membrane keyboards. That is what I feel and you might have different thoughts regarding the matter, so do let us know what you think and prefer. Another issue that you might face with a membrane keyboard is that if you are typing really fast, a key might not register because you did not press it all the way. I spend a lot of time typing and this has happened to me more than a couple of times and it can get very frustrating indeed. If your work involves typing and you play games as well then this is something to keep in mind. Keyboards these days are pretty durable and can last months if not years but generally membrane keyboards wear out sooner as compared to mechanical keyboards. The membranes just wear out and the keys feel mushy. That can happen to pretty much any membrane keyboard after extensive use. Cleaning can also be an issue. Membrane keyboards do not commonly come with removable keycaps, which is an option on most mechanical keyboards. Mechanical keyboards use switches to transfer typing signals and there are different kinds of switches with different kinds of properties. Each switch performs differently and that is why you need to check the type of switch a keyboard has before buying one. The most common switches that you will find in a mechanical keyboard are Red, Blue and Brown. Some require decent force to activate while others don’t and some make a clicking sound when pressed while others don’t. There are plenty of advantages of getting a mechanical keyboard over a membrane keyboard. Mechanical keyboards often come with removable keycaps which makes them easier to clean and customize. You can get all kinds of keycaps which can be used to replace existing ones or to customize your keyboard according to your preferences. 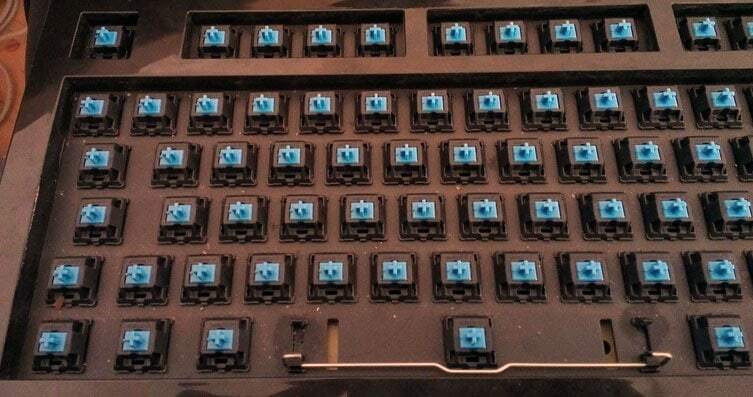 Since there is no membrane, mechanical keyboards are more durable as compared to membrane keyboards and will last you a long time provided that you take proper care of the peripheral. They also stay pretty much the same from day one till when you dispose of the keyboard because there is no membrane that wears off over time. Mechanical keys do not require a lot of force to activate and this can be a major advantage when typing or gaming. You will be able to press plenty of keys quickly without missing a key. With a mechanical keyboard, you do not need to press the key all the way down in order to register it. This can be a major game changer if you do a lot of typing or play competitive online games that require faster response time. A mechanical keyboard uses switches and that is why it is going to be a bit heavy as compared to a membrane keyboard. This can be a pro or a con depending on what you are used to and what you look for in a gaming keyboard. Now that we have got all the advantages out of the way, let’s look into the cons of a mechanical gaming keyboard. Mechanical keyboards generally use better technology and expensive materials that is why these are more expensive as compared to membrane keyboards. Depending on the kind of switch you go for, the keyboard can be pretty loud. While some switches are louder than others, mechanical keyboards are generally louder than membrane keyboards. This is something that gamers like. The tactile and audio feedback is something that I personally enjoy but this can be seen as a major con especially if you live with other people. Mechanical keyboards come with switches and better materials and that is why they are generally heavier as compared to membrane keyboards. This can be a pro or a con depending on what you look for in a gaming keyboard or what you are used to. We have gone through the different pros and cons of both types of keyboards which show that neither type is perfect and that there is no option that suits all. Keeping that in mind you should get the one that suits you the best. If you are on a budget and need a gaming keyboard that will get the job done then a membrane keyboard should be fine. Keep in mind that the membrane will wear off over time and that you will need to replace it. Membrane keyboards do not come with removable keys so cleaning the keyboard will be a bit tricky. If money is no object and you need proper peripherals for gaming then you can go with a mechanical keyboard that will allow you to press multiple keys at the same time. You will also not need to press a key all the way in order for it to register. This will also come in handy if you type a lot. Mechanical keyboards come with removable keycaps and that is a useful feature to have when cleaning the peripheral. This also allows you to personalize your keyboard to a certain degree which can be a lot of fun. Keyboards come in all kinds of designs and layouts but there are generally three different sizes that you can choose from. Here we are going to look into these different sizes and tell you about the differences. A full-size keyboard has all the buttons including the arrow keys and the number pad. A 10 keyless keyboard will have the arrow keys but does not come with the number pad. This is the type that I personally prefer because I do not deal with a lot of numbers. I usually type words or play games so the lack of number pad does not bother me. This is something you will like if you like minimal design keyboards that are simple and unique. The compact keyboard the smallest of the three and that is because it does not have arrow keys or the number pad. If you are short on space or like things simple and compact then this is something that you should look into. A wrist rest might be the last thing that comes to a gamers mind when setting up a gaming system. These do not seem as important as other gaming accessories. Wrist rests comfort your wrists and let you type or game for longer periods of time. You may not realize the importance of a wrists rest until you start feeling discomfort or start using one. In some cases, the wrist rest is integrated into the keyboard and you are getting it for free. At times the keyboard does not have such an option and you need to get one separately. Dedicated media keys are always appreciated as they can help you adjust the volume settings without leaving the game. While there are shortcut keys that can be used instead of the dedicated keys but they are still appreciated. Weight is another factor that you need to keep in mind when getting a keyboard. If you are on the move and need to keep your keyboard with you then you should opt to go with a membrane keyboard as it is the lighter option. Mechanical switches and premium materials make mechanical keyboards heavier which decreases portability. Keyboards are usually plug and play and do not need any additional drivers. Some features can be limited by the operating system. Most keyboards will work fine with Windows but you will need to check compatibility with Mac OS and Linux. If you use Windows then you should be fine but you should check compatibility if you are going to use the keyboard with Mac OS or Linux. While this is not a major factor to consider when buying a gaming keyboard, having a keyboard with a longer cable will make it easy to manage cables. Hiding cables out of sight is something that gamers like to do in order to make a clean setup. If you are concerned about cable management then you should consider getting a keyboard with a longer cable. If you have already made up your mind and the cable is not long enough then you need to worry as there are third-party cables that can help you get the job done. We have talked about the different types of keyboards on the market right now and the ones that we can recommend. I hope that all this information will be enough for you to make an informed decision regarding which keyboard you should get. At the end of the day, there is no option that suits everyone and you should select the option that checks all the boxes for you. Remember that a mechanical keyboard is better for gaming and typing and it is also more durable as compared to membrane keyboards but you should go for a membrane keyboard if you are on a budget. All things considered, you do get what you paid for so expect to get features and quality accordingly. GamingFeature invests hundreds of hours of research and testing to help our readers in finding products that fit their specific needs. You support us through our independently chosen links, which earn us a commission. Read more about what we do.